This five-passenger (chauffeur included), luxury vehicle will get you where you’re going in style, and with all of your belongings packed comfortably. With an impressive amount of cargo space, you’ll be able to store up to three medium-sized pieces of luggage in the trunk, so you won’t need to leave anything behind. The sports suspension and lightweight build allow this vehicle to hug every curve along your journey while keeping you safe with its many safety features. Backseat passengers will enjoy an excess of rear legroom to keep them comfortable on extended drives. You will also enjoy dual rear-seat LCD screens with a DVD player to make sure that they’re always entertained — especially the kids. The tri-zone climate control is a great way to please all passengers and guarantees that everyone will be riding in comfort. This chauffeured vehicle is the perfect combination of sophistication, harmony, and luxury from the inside out, and the attention to detail is astonishing. All of our vehicles are maintained with you in mind, so you’ll never be disappointed in the cleanliness or quality of your chauffeured vehicle. When you choose the Holden Caprice hire car, you’ll get where you’re going with the sporty, sophisticated vehicle of your dreams. 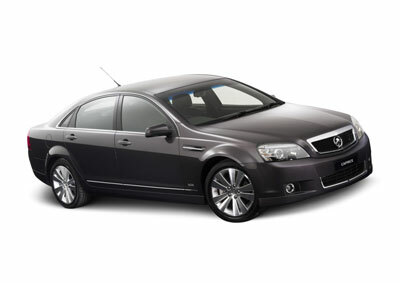 Let one of our Sydney chauffeurs get you from A to B in our general hire car Holden Caprice.